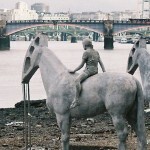 When I first saw Jason deCaires Taylor’s sculpture, The Rising Tide, I was godsmacked! For all you Yanks out there, godsmacked is British slang. To translate into the American lexicon, it means astounded. 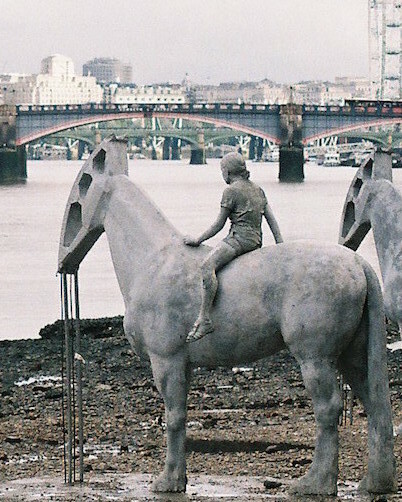 The way the sculptures seemingly rise up at low tide on the Thames Vauxhall foreshore is spooky. 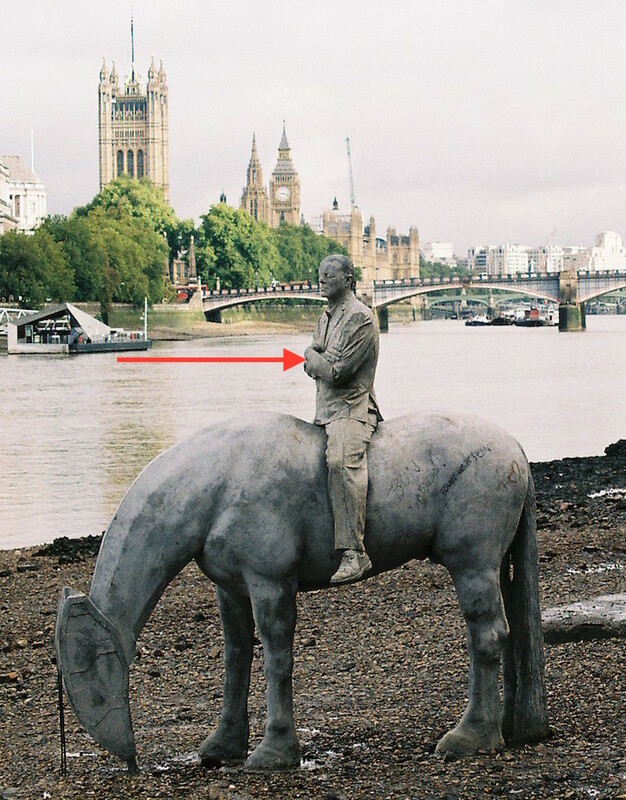 Then, as the Thames tide rises, the horsemen disappear, only to reappear with the next low tide. 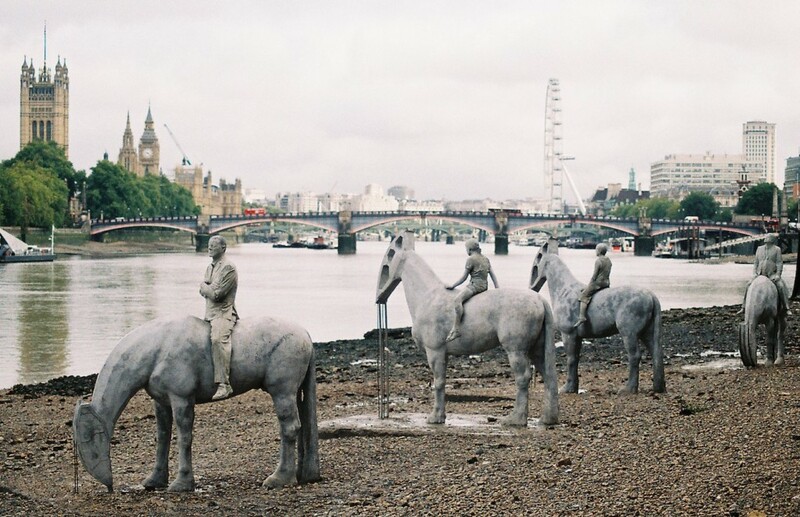 deCaires Taylor’s exhibit is part of the Totally Thames Festival, September 1-30. Jason deCaires Taylor is educated in the arts, but also a dive instructor and underwater naturalist. Thus, his sculpture is a junction of art positioned under water (UW). His sculptures are numerous: a sculpture park off the coast of Grenada (West Indies), MUSA (Museo Subacuatico de Arte) off the coast of Cancun, Mexico. 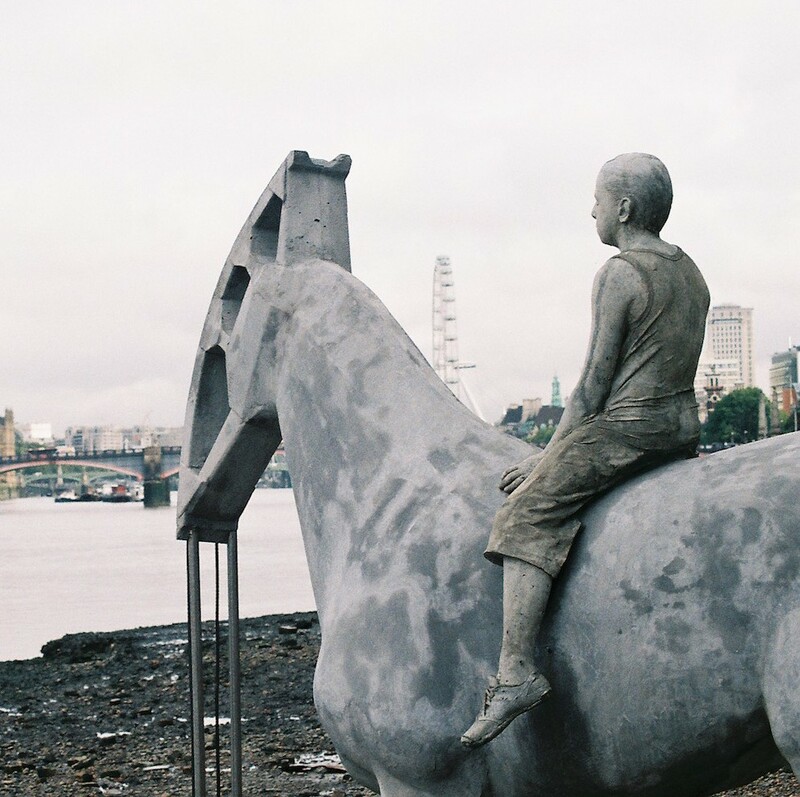 And,this sculpture, his first London commissioned work for Totally Thames. Mr. deCaires Taylor’s work addresses an all encompassing message: encourage environmental awareness, instigate social change, and develop an appreciation of the breath-taking natural beauty of the underwater world. (from http://www.underwatersculpture.com). I wanted to decipher the connection between the four horsemen and the message of environmental awareness and social change. The following is my interpretation and I have no authority to proselytize what the artist is trying to say. I encourage your views. What do you see in this sculpture? 1. Overview – two male, two female horsemen. 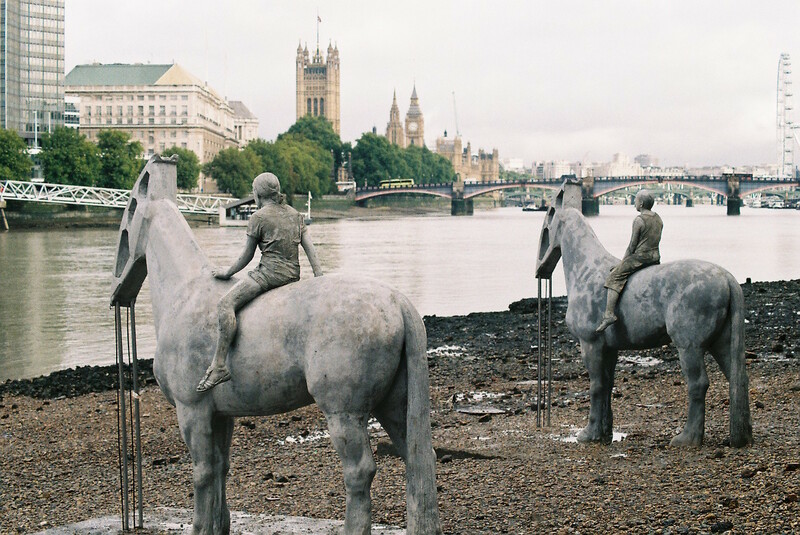 The horses ridden by the women face parliament and Big Ben. Or, more immediately, they face the Thames. The River Thames has always played a major role in commerce, war, food, and transportation. The Thames is the heart of London, or possibly, let’s say, its future. 2. The two females are young, dressed casually, maybe even sisters. I estimate the youngest to be around 9-10 years of age. The older girl is a teenager, approximately 15, and has a definite air of confidence. The hand is comfortably placed in a relaxed gesture. Are they the “rising tide” of the world? Note that the girl’s horses have their heads up. Horses of the males, the head is pointed down. The horses heads are oil drilling jacks. I’m unsure what Taylor is saying about “environmental awareness” but the theme is consistent with each horse. Certainly the world is feeling the impact of oil in every aspect of life. 3. 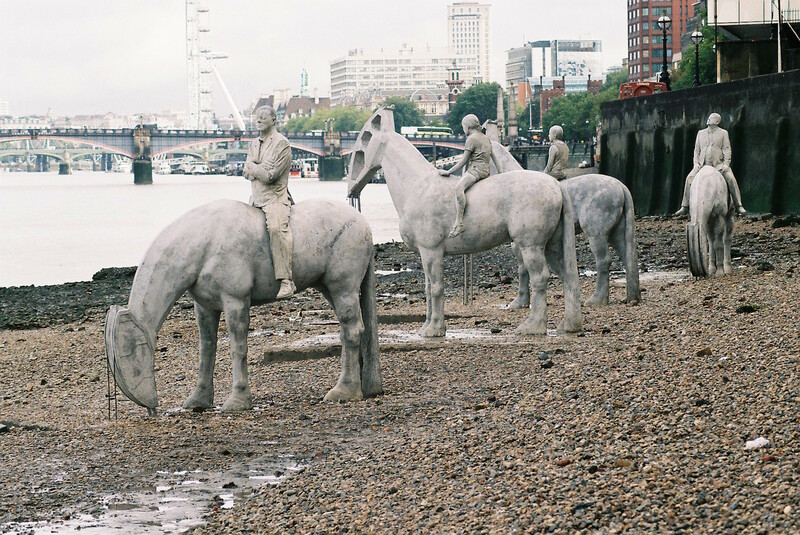 The two horsemen are considerably older than the girls and facing away from the Thames. Possibly the old guard is ready to turn over the Thames and London’s future to a new generation. The elder statesman has his eyes closed and carrying a hefty paunch. His clothes are those of a successful English gentleman. The younger man is dressed more casually, but his eyes are closed also. The most interesting thing about the younger man is his arms are crossed, signifying an unwillingness to change ideas, or as Taylor might reflect…refusal to instigate social change, keeping the status quo. Does the future belong to young females? Is the tide changing so that women become the forward thinkers, the peace makers of our world? I don’t know, but I find it an interesting notion. 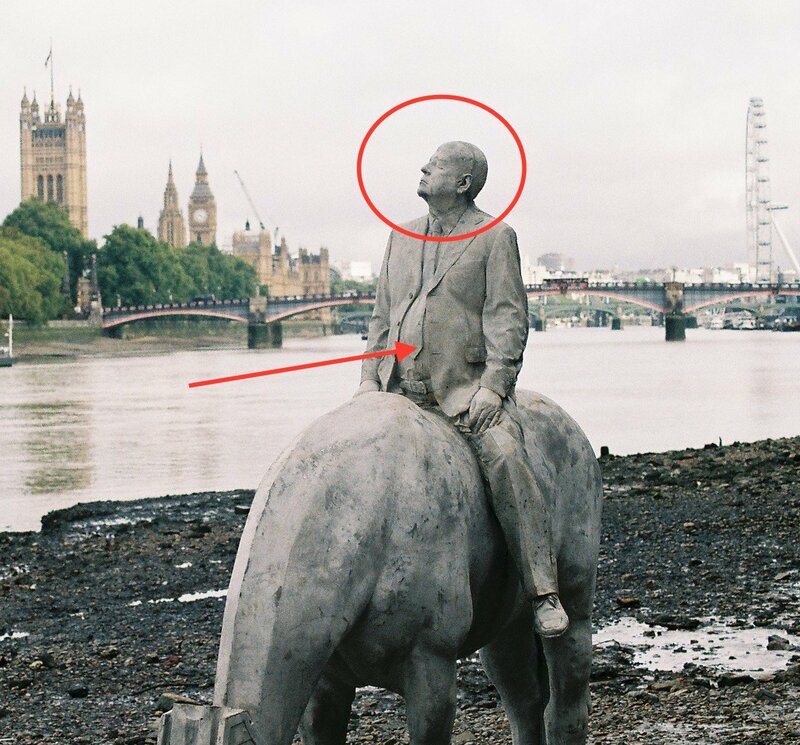 Above all else, I wish I could see this sculpture in person, but, alas, I am not in London to participate in the appreciation of the River Thames. However, if you are in the area, here is some information to direct your attention to this sculpture. Ian P. Hardy shot all the photos for our book, Walk London. He and his camera are one. Photo Walks of London, Ian’s business, is to help tourists shoot great photos of London. His boundless skills will help you make those professional looking photos to impress yourself, friends and family. When I heard about The Rising Tide Sculpture, I asked Ian to take some photos to share with my FAB readers. On your next trip to London, spend an afternoon taking great photos with a little help from a friend, Ian.